slothmuffin on Zibbet: slothstuff - slowly, sweetly, and with love. 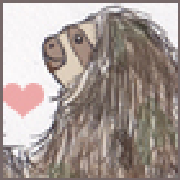 slothstuff - slowly, sweetly, and with love. Hi, and welcome! I'm Kathleen, and I love making things. As the "sloth" half of this shop name suggests, it's a slow little place. I don't have time to list things as often as I'd like, but I do check my email frequently, so please contact me if there's something you're interested in and I'll get back to you as quickly as possible. If you see anything you like but would like better if it were a little different, send me a message! I can't guarantee that all custom orders will be possible, but I'd love to discuss them with you.